Sorry for skipping last week. I only planned on doing a brief write-up anyway due to returning from my trip but I forgot there was an early start for the tournament. By the time I sat down to do the tips the tournament was already bloody underway! Oh well. 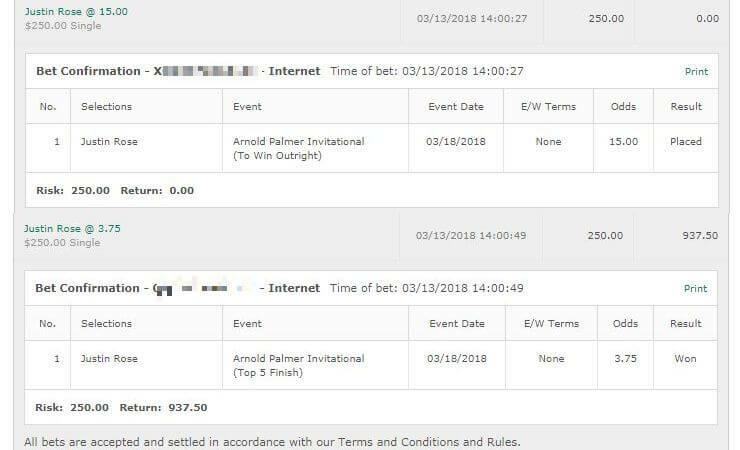 Todays tips are a bit late as stupidly – I thought this was the Masters week. Not sure how I got that mixed up but I spent all of Tuesday studying previous form etc for the Masters. Then I went to check the betting odds and oh yeah – it’s the Houston Open! Alright so we’ve got the Shell Houston Open this week and we’ve got our usual mixed bag of participants. Right at the top are Jordan Spieth, Jon rahm, Henrik Stenson and Rickie Fowler. Rahm is of coruse on absolute fire at the moment although you have to wonder if fatigue is going to set in for the guy. Previous form for this course isn’t always an indicator. Look at Matt Jones who won it 3 years ago but has 5 tournaments where he didn’t make the cut. However there are some players who consistently do well here. Cameron Tringale: A quarter unit bet on Tringale to win and E/W. A combination of the odds and his past form here where he’s had two top 5 finishes. I’m not expecting much but he had that top 10 finish at the Genesis Open recently. And he bounced back from a couple of poor performances at the Honda Classic and Valspar to do well in the Puerto Rico Open. he may just be getting on a roll on a course he’s familiar on and I’m fine with taking a nice long shot bet here. 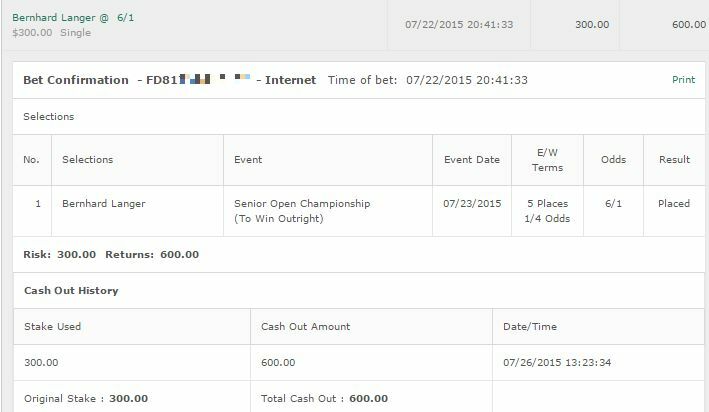 Jon Rahm: Quarter unit bet on Rahm to win. His form is amazing at the moment and he showed his consistency on the amateurs. I’m not 100% sold on it but with a weakened field and him choosing to play it he’s obviously got the confidence going. Odds aren’t enough to do E/W and I do think it’ll be too much for him – but I’ve been wrong before and I’ll be happy betting on him here even if it blows up in my face (hence just a quarter unit). It’s annoying as the more I look at things the more I want to tip Spieth for a big bounce back win but I just can’t do it. I don’t know if he has the drive for this one. Charles Howell III: Some solid performances in the past here and he’s got some nice form going stretching back to the beginning of the year. I’m comfortable backing old Charley boy for a quarter unit to win and E/W. 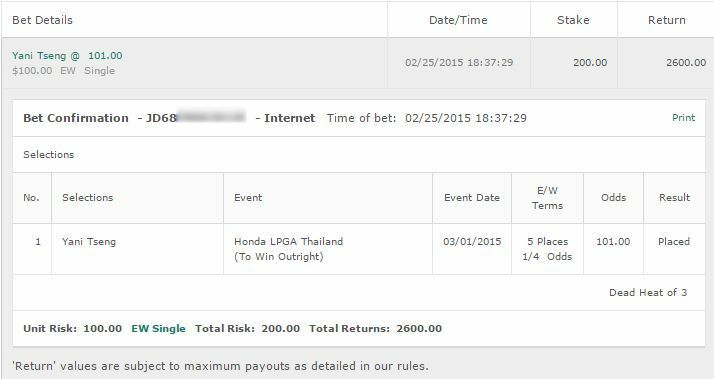 In the LPGA this week, Lexi Thompson is worth a quarter unit to win and E/W. After a poor performance at the Bank of Hope Founders Cup she looked a lot more solid at the Kia Classic. I’ll back her to continue that form and get a place here. This is the sort of course where a solid performance each day is what usually takes it for you. She’s won here previously so maybe she can shock us with a big one. Quarter unit on Charley Hull to win and E/W as well. Not feeling too confident about this one but Scott Dunlap is worth a quarter unit I’d say to win and E/W. He is pretty damn solid on this course although his current performances this year have been disappointing.